These are the world's best apple dumplings. The recipe is a family favorite and originated in the Amish country in Lancaster County, PA where people definitely know how to bake. It's easy and quick. Perhaps the most important thing about baking great apple dumplings is getting the dough right so it's light and flaky. This recipe makes six of the best apple dumplings you've ever tasted. One step that sometimes confuses people is how to actually form the dumpling... wrapping the doe around the apple and getting it to stay in place. Again, this and all the steps are made easy because the process is clearly shown in videos. 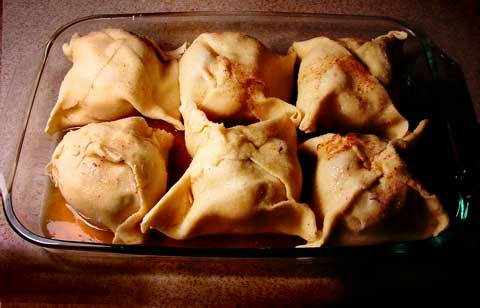 So are you hungry for some great apple dumplings? 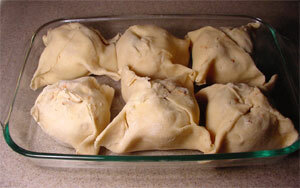 Click on the Apple Dumplings Recipe & Videos Tab and let's get started! 1 Cup Sugar Place the sugar, water, cinnamon, and nutmeg in a small saucepan. 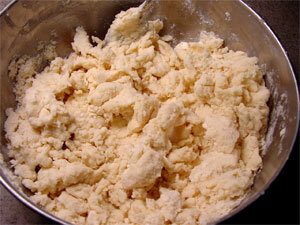 Add butter or margarine and stir until melted. 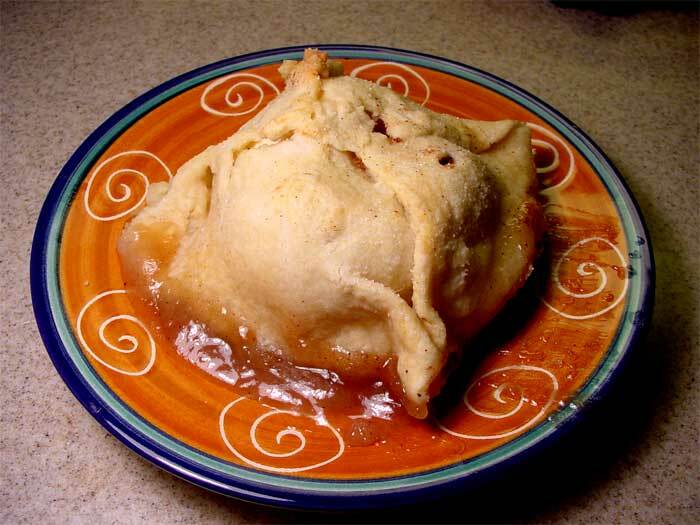 When it comes to apple dumplings, bigger is not always better. 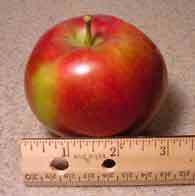 I use Macintosh apples that are about 3 inches in diameter. You'll see later that it makes it easier for you to make the dumpling. Add the shortening to the bowl and cut in shortening. Not familiar with the term cut in shortening? You're simply passing the fork through the mixture. You can see what I mean in the movie on the right. Hover over the picture on the left to Zoom In to see how the mixture should look when you are done cutting in the shortening. 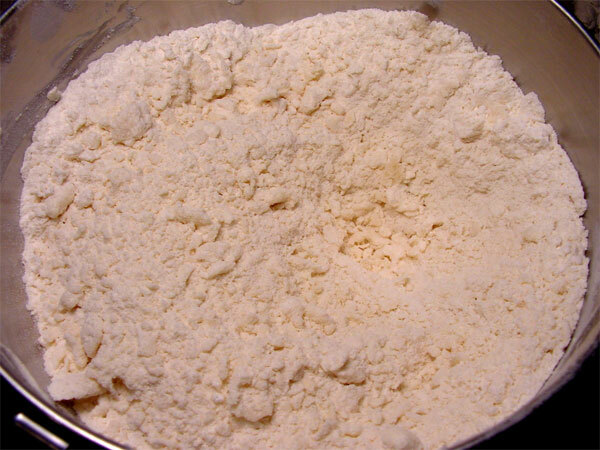 Add milk to bowl all at once and use a fork to just moisten the mixture. The picture on the left shows how the mixture should look after you have moistened it with the milk. Hover over the picture on the left to Zoom In to see how the mixture should look when you are done moistening it with the milk. Place the dough mixture on a lightly floured pastry board. 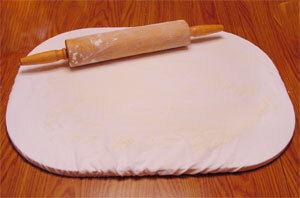 Roll the dough out until it is large enough cut six 6-inch squares (one for each apple). It's finally time to peel the apples! I peel them and cut them in half. I then cut out the core. I also think that cutting them in half helps insure the apple bakes thoroughly. 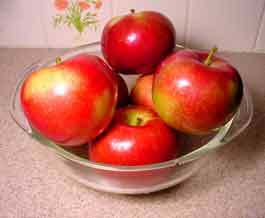 I keep the apples from turning brown by placing them in a bowl of ice water. I put ice cubes in the water to keep it as cold as possible. 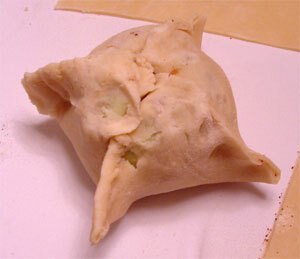 Place the apple on one of the 6-inch dough squares holding the two halves together. Pour some sugar into the apple and then generously sprinkle with cinnamon and nutmeg. I just about fill the center of the apple with the sugar. Place a pat of butter on the top. Take a little water and moisten the edges of the 6-inch dough square. 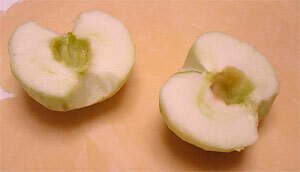 Fold the corners to the center of the top of the apple. Do you see now why you want smaller apples? 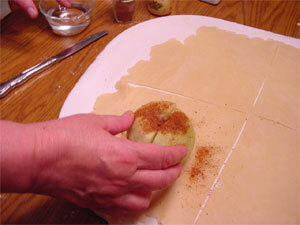 If you start to run a little low on dough doing the final apples you can always roll it out a bit more. 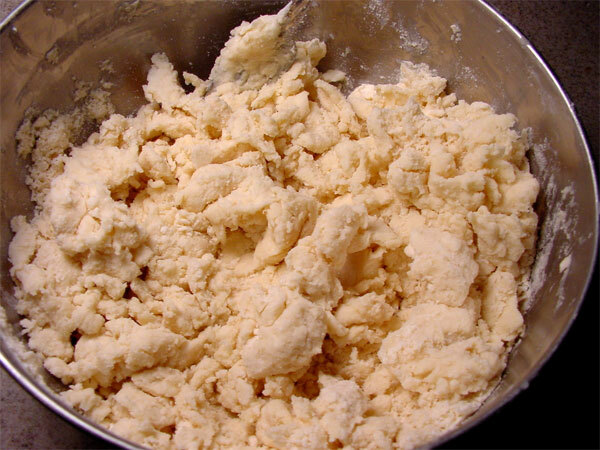 Pinch the dough together at the seams. Try to place the apple dumplings in the baking dish about an inch apart if possible. You can see mine were a little close in the picture... but they got perfect anyway. Pour the sauce we made earlier over the apple dumplings and then sprinkle them with sugar. 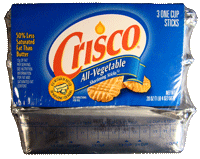 Place the baking dish in the oven preheated to 375° and bake for 35 minutes. Please help me support my recipe website... and family for that matter... by clicking here to visit my online store. Find out what I have to offer and please keep me in mind if the need arises. I promise no one will treat you better and you won't find a better, easier and safer place to shop with Volume Discounts and Free Shipping. You also get a No Risk Full Cash Refund Satisfaction Guarantee on everything I sell. Thanks! Hope you like the apple dumplings! Simply pour a little milk on them in a bowl. In the rare event that there are any apple dumplings left over the next day, heat them up in the microwave. 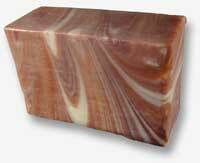 Click here to find out more about Blackberry Creek Natural Handmade Soaps... Are you constantly looking for your TV remote control, wallet, purse, cell phone, or keys? Do you know someone like that? For just $17.97 you can get a user-friendly traction device that slips over your shoes and boots and stops you from slipping on ice and packed snow. If you like the recipe, please link to my website. Suggest a link to my website to other organizations or blogs. I would be very grateful if you do.